Sharing text or code over internet now made easier and faster than ever before! 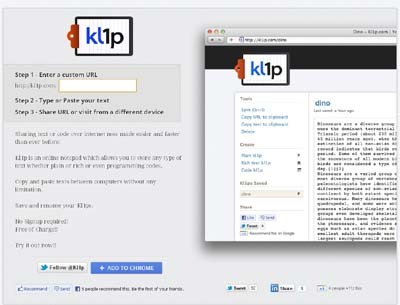 Kl1p is an online notepad which allows you to store any type of text whether plain or rich or even programming codes. Copy and paste texts between computers without any limitation. Save and rename your Kl1ps. Plain, Rich and Code text in one page. Can have multiple kl1ps under one page.